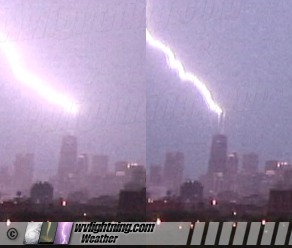 pseudoparanormal: Can Lightning Strike The Same Place Twice? I have always believed the old myth that lightning can't strike the same place twice. The question at hand is, Can It? Now that I think about it, I feel pretty dumb because it really is inevitable. It may not happen right away but it's bound to happen in the future. Lightning has no prejudice or memory of where it's been before. I chose this topic because I've always really loved watching lightning, while on the beach or sitting on my porch, which I know is really unsafe but, there's just something about it that is so cool when it strikes. I used to think I'd be okay if I went over to look wherever it had struck. The objective or goal is to prove that Lightning can and will strike the same place more then once. The information that I found is as such. The one article I read stated, it may be ten minutes later or it may be a million years later, but who knows when it will strike the same place twice? A strike doesn't do anything to affect the electrical current going on above and continues to strike once it is "recharged." Now after reading this, my point of view is that, I can't imagine why I thought this in the first place. I completely believe it, and will definitely think twice the next time I'm out on the beach in a thunderstorm.